Beautiful underwater fashion photos with a prop that will surprise you. At one time or another, you must have come across beautiful underwater photos of ethereal models, their long dresses flowing with the sea current. Take a look at the photos below. 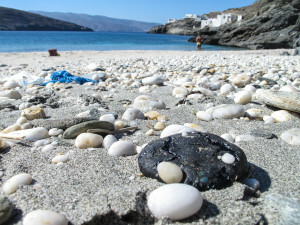 They were taken this summer in the Cyclades, a beautiful and popular vacation destination in Greece. My beautiful, patient and highly cooperative volunteer models are not using lavish fabrics for their poses. Instead, they are using objects found in the very waters they are swimming in. That’s right. Unfortunately, these objects that are part of the beautiful photos you see, are nothing more that trash, collected from the bottom of the sea, near the beach, some tangled in seaweed, others approaching the shore floating in from a different country. See the crystal clean waters? The flawless bottom? The white rounded pebbles? This photo was taken at a marvelous deserted beach that formed part of an astonishing landscape. 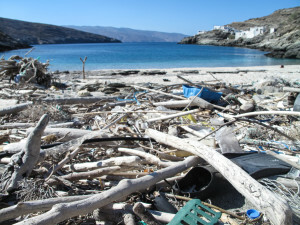 Unfortunately, at less than 5 meters from the shore there were massive amounts of trash that had floated there from -possibly- hundreds of miles away. 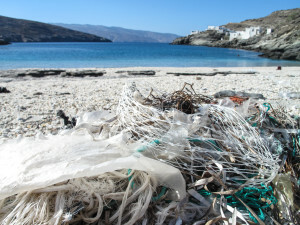 It’s easy to detach oneself from this and simply say, “I never throw my garbage onto the beach, it’s not my fault”, but we are all part of this problem. We must all make a conscious effort to prevent any objects from ending up into our seas and oceans. We can all definitely make sure we leave nothing behind when we leave the beach. We can pick up any garbage we find around us. We can spread the word and make the people close to us aware of this. We can influence our local officials through relevant groups and organizations. We can do things about it! No one wants to swim in a sea of garbage. But guess what… we already do!